LABA Artist Karen Loew made this film which premiered at the 14th Street Y’s LABA Festival about the intersection of 14th Street and First Avenue in Manhattan. Have you met Christen, our BUFF BRIDE? Christen has been working out with Jordan, one of our stellar personal trainers in preparation for her wedding this autumn. In addition to these morning workouts with Jordan, Christen has been a regular attendee of our Monday and Wednesday evening YOGA classes with Lauren. For proof of how great she’s doing, take a look at Christen in this photo from a recent Monday evening class. Christen is pictured in the front of this photo, performing a yoga pose that all at once works the core, creates space and flexibility in the back and chest, strengthens the legs (particularly inner and outer thighs), and releases tension through the breath. Have you tried one of our Yoga classes yet? Take a look at our schedule and see which one works for you! 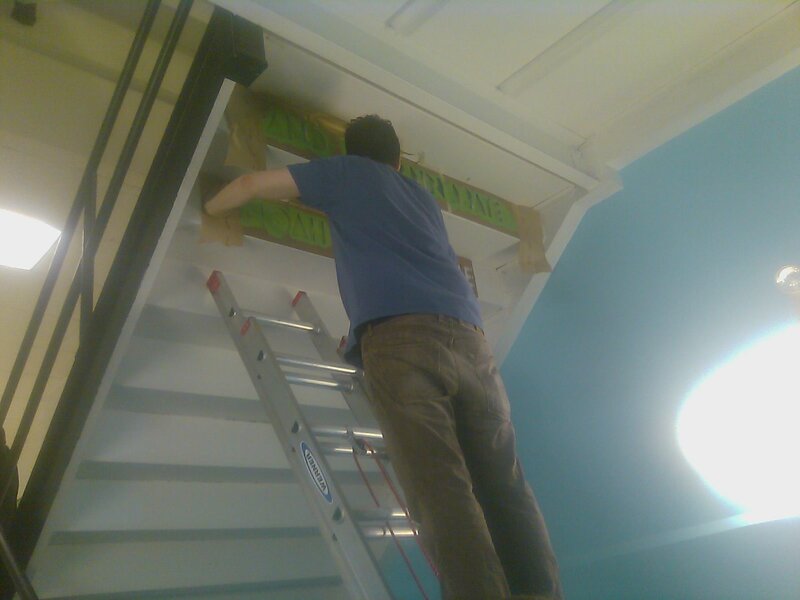 Dressing the Building for the Festival! When you look around, you can see letters and messages, pictures and color. We’re dressing up the Y for our 4th Annual LABA Festival! These letters are hidden under our staircase. Can you find them today? This is Christen! Christen is getting into her best shape ever for her autumn 2012 wedding by working out with our Personal Trainer Jordan , 14th Street Y Yoga classes, and by eating enough healthy food to fuel her work and progress. We’ve posted Christen’s most recent workout here. 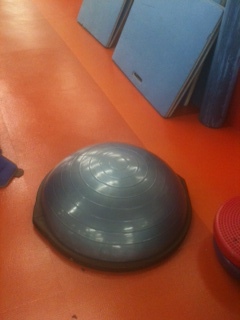 Try it the next time you’re in our fitness center! We like the routine in the stretch link! Stay tuned next week for Christen’s next workout! Sometimes pictures speak better than words. 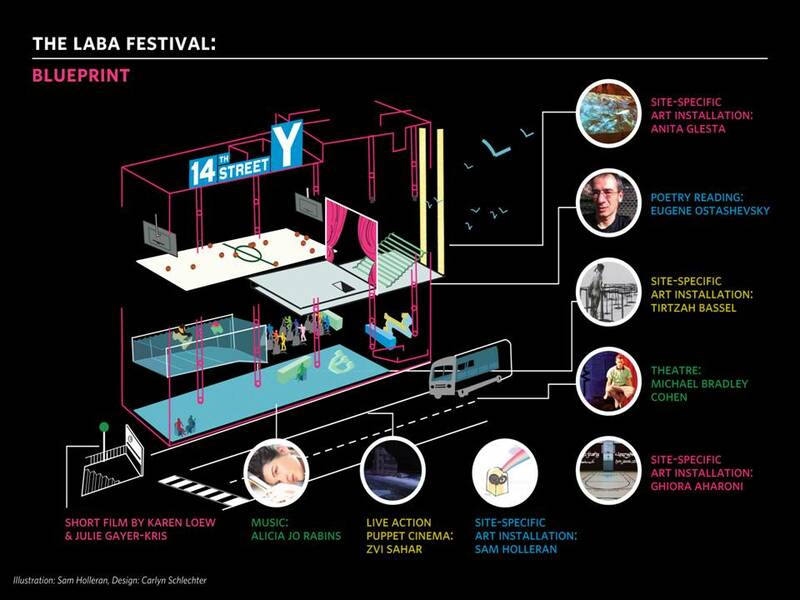 Check out this beautiful picture to see what’s happening at this year’s LABA Festival–Saturday, May 19th at 8:00PM. Balance and Strength with the BUFF BRIDE! Welcome to our BUFF BRIDE’s latest workout! Personal Trainer Jordan has been mixing strength with lots of balance and coordination exercises recently, which is going nicely with Christen’s regular Monday and Wednesday evening Yoga Classes here at the Y. We’ve put in links to explain the exercises that may need some explanation. Try it today and let us know how it’s working for you! Lateral hand and feet walk 10’ down and back with 10 Mountain Climbers at each end.